Candidates on stage at the gubernatorial town hall, part of the 26th Annual Empowerment Congress Summit at USC on Jan. 13, 2018. From their first responses to their closing statements, the six candidates vying to be California's next governor came out swinging at Saturday's town hall. They weren't the only ones who got contentious. A vocal crowd cheered and booed as the contenders spoke, ignoring repeated pleas from the moderators to stay quiet. 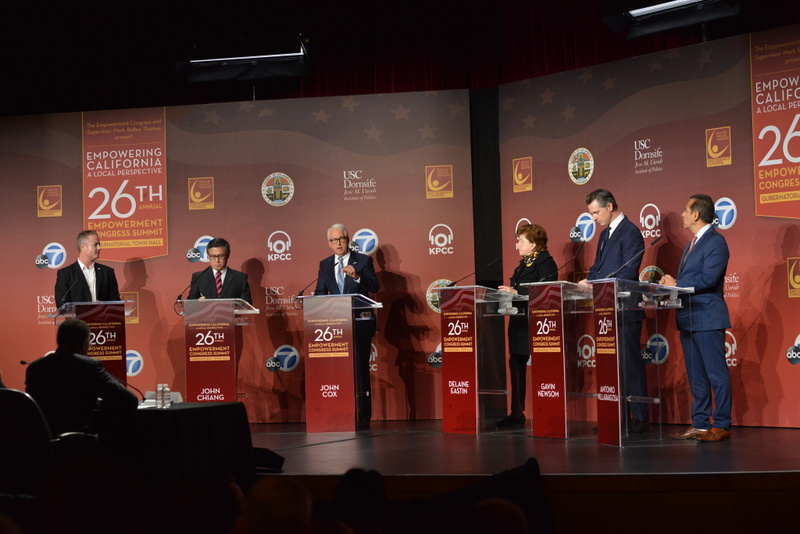 Four Democrats – State Treasurer John Chiang, Lieutenant Governor Gavin Newsom, former Superintendent of Public Instruction Delaine Eastin and former Los Angeles Mayor Antonio Villaraigosa — and two Republicans — businessman John Cox and Assemblyman Travis Allen — fought to stand out from the pack at the first major debate in California's gubernatorial race. More than 1,000 people showed up at USC for the event, which was also broadcast live online. "What happens in California doesn’t stay in California," said KABC news anchor Marc Brown, introducing the candidates at the forum. Brown co-moderated the event along with KPCC senior political reporter Mary Plummer. The candidates tackled a range of topics including taxes, immigration, education, health care and criminal justice reform. When asked how they'd deal with rising homelessness across the state, Cox and Allen voiced concern that some of those living on the streets had criminal backgrounds. Villaraigosa responded: "I know what we don't need to do is demonize the homeless in the way that some people are doing." Chiang, Newsom and Eastin all said homelessness should be tackled by building more housing and offering supportive services to treat people with mental health or substance abuse issues. 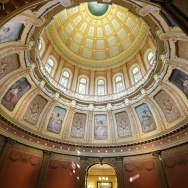 Republicans Allen and Cox both took aim at current Gov. Jerry Brown. "All of the Democrats want to deflect from the true issue, which is illegal immigration," Allen said. Later, he vowed, "We must secure our borders, we must ensure that we are never a sanctuary state and we must ensure that California enforces federal immigration law." 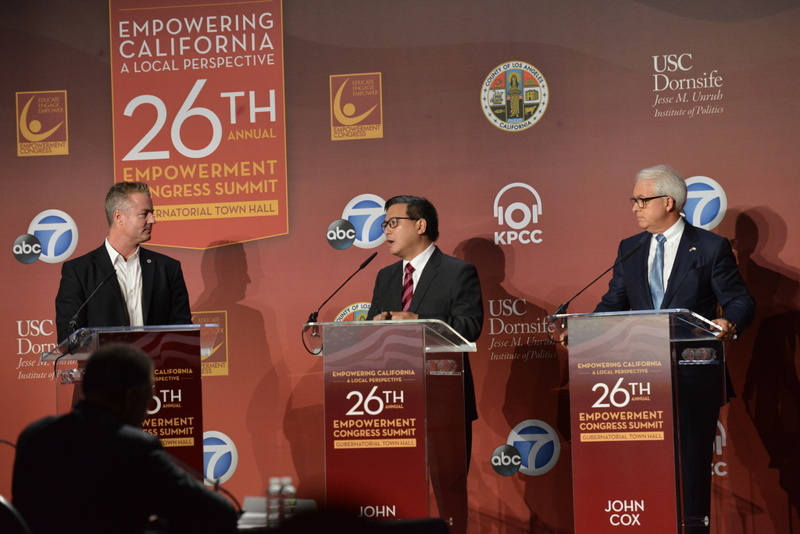 From left gubernatorial candidates Travis Allen, John Chiang and John Cox on stage at the 26th Annual Empowerment Congress Summit at |USC on Jan. 13, 2018. President Trump was a flashpoint for controversy. While Allen and Cox spoke in support of President Donald Trump, Democrats offered sharp criticism. Villaraigosa was asked how he'd work with the Trump administration. "He was calling Mexicans rapists and criminals. He was going after Muslims. He was comparing white supremacists with people protesting racism in our country. How can I work with him? With great difficulty, obviously," he said. 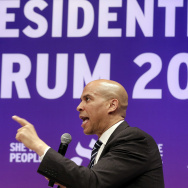 Democratic candidates also took aim at each other. Most of their attacks targeted Newsom, the current frontrunner. 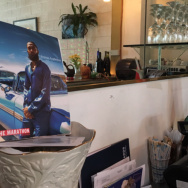 After Newsom touted San Francisco as the top-performing urban school district, Villaraigosa called it the worst district for African Americans. 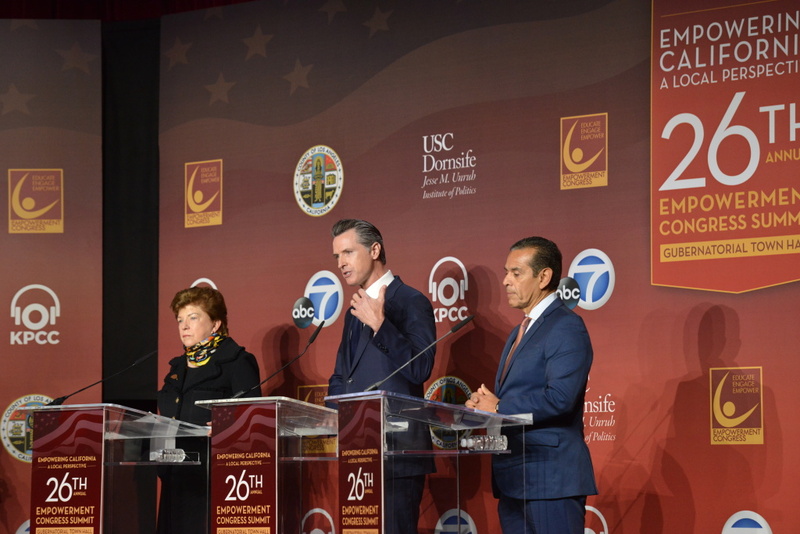 From left, gubernatorial candidates Delaine Eastin, Gavini Newsom and Antonio Villagaigosa on stage at the 26th Annual Empowerment Congress Summit at |USC on Jan. 13, 2018. Although the would-be governors tackled long-standing issues, some observers say this election is anything but conventional. Raphe Sonenshein, the executive director of Cal State LA's Pat Brown Institute for Public Affairs, expects the upcoming gubernatorial election to be the state's most contentious in modern history. "You're electing a governor who will have to manage a relationship between the largest state and a national government that's pursuing goals that are very different from that of the state's leadership," Sonenshein told KPCC. "As the year goes on, the candidates aren't always going to be asked, 'What would you do in an ideal world?' They're going to be asked, 'What would you do in light of what Washington just said yesterday or the week before or is likely to do a week from now?' That's a whole new thing. I don't think anybody has ever run for the governor of California in that circumstance." Sonenshein says this election is also different because the candidates are truly vying for an open seat. 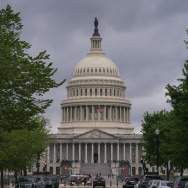 In previous years, incumbent Gov. Brown had the clear advantage. Who showed up for the latest governor's debate? And what did they have to say?